Richie Hawtin‘s darker alter-ego Plastikman returns with a new live show debuting at Time Warp festival in Mannheim, Germany on March 27. The show will continue through a total of 15 dates, partnering with visual architects Derivative and visual designer Ali Demirel. Viewers of the show will experience a unique integration of audio, visuals and interactive technology, which now includes a customized iPhone/iPod Touch application called Plastikman SYNK. 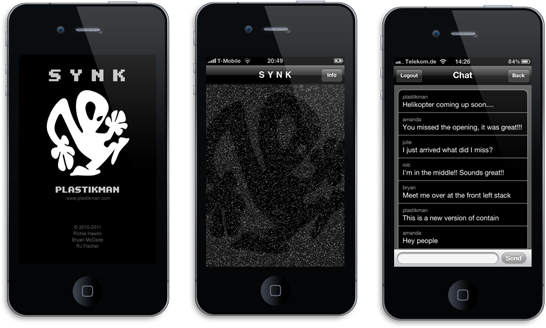 Conceptualized by Richie Hawtin and developed with RJ Fischer (hexler.net) and Bryan McDade (Minus), SYNK is the official companion iPhone/iPod Touch application of the 2010 Plastikman Live worldwide tour. SYNK users will participate in an experiment in audience-performer interaction aiming to blur the lines of perception and participation. Participants should connect to the Plastikman Wi-Fi network at each performance and will be notified of the activation of the different states by their iPhone/iPod Touch at specific moments during the show. The SYNK experience will not be limited to viewers of the live show. In between the performances the SYNK application will be in sleeper mode and function as a Plastikman atmospheric location shifter. By using visualizations inspired by Derivative, combined with the iPhone’s built-in microphone and accelerometer, users are immersed in a Plastikman environment. For best results, please use headphones. Based upon earlier “Logikal Nonsense” and “Vokx” voice tracks, this state invites the audience to re-organize the word samples using a user interface of 20 touch buttons. In this state the centre of performance control is moved from the stage and into the audience. This state explores the synkronicity of realtime-generated percussion patterns and their visual counterparts, integrating the stage LED wall and the built in displays on each SYNK activated iPhone/iPod Touch. This state is accessible throughout the show and gives users a live video stream of an internal perspective of the performance. This state is active during the entire show with realtime performance information. At specific moments an extended Konsole state becomes activated, allowing further insight into the realtime programming of the performance’s drum and percussive elements, while also providing visual feedback of musical and effect parameters. A simplified remote Konsole is available to all SYNK users worldwide and will be activated during all Plastikman Live performances. Audience-performer interaction experiment blurring the lines of perception and participation. SYNK is a site specific application designed to enable audience interactivity at the following live Plastikman events. As such, do not expect SYNK to fully work some 7 year after the tour has ended!